Borrower and carry and regroup? Oh my! The picture on the left is from one of my 9th graders. We were reviewing multiplying decimals (an elementary skill). The student did not understand place value and thus did not understand how to carry when she was multiplying. She did not have the number sense to realize that her answers were incorrect. 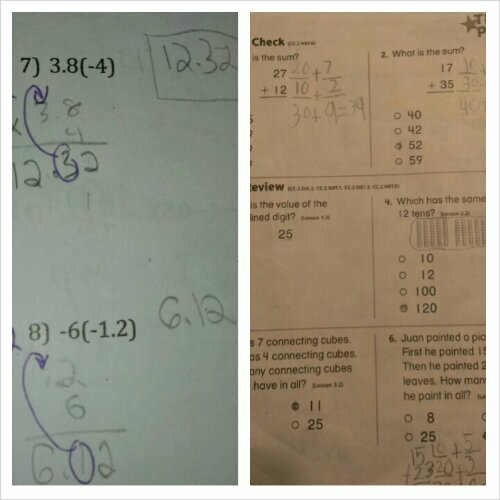 The picture on the right is my son’s 2nd grade math home work based on the new state standards. He is being asked to show his number sense and understanding of place value by showing that he is not simply adding a 7 and a 2 then adding a 2 and a 1. He is showing that he understands that the 2 and 1 are in the tens place thus he is really adding a 20 and a 10. This problem seems simple to us as adults that learned math in a traditional manner- by following the rules our teacher taught without a genuine understanding of what was really going on. Most of us were probably decent students that knew how to play the “game” of school and followed a lot of rules for a long time. When we got out of school and stopped practicing our rules much of our math skills have escaped our memory. I want to challenge that notion. I think many people struggle with math for 2 reasons. 2. We struggle because we don’t understand what’s really going on. We want quick simple rules to follow (because we are lazy-see #1) but we don’t remember the rules because we don’t realize what is going on. It doesnt stick with us because we havent made real sense of the concept. Teacher have long been guilty of teaching the rules so kids will pass the tests. Kids bef for rules because it is easier than actually thinking about whats going on. I became a math teacher because I always wanted to know why we were following all these rules. Until I understood the why, I couldn’t follow the rules correctly. I didn’t have many teachers that were willing to help me with the why. I struggled to figure it out on my own. I hope the new standards and approaches to math education will change our thinking and feelings about math and will help get rid of math’s bad reputation. We went to the hardware store today to pick up a few items for a project we are working. The hubs called me around to his side of the truck and pointed to the truck bedind us (pictured above). The hubs told me to take a closer look. 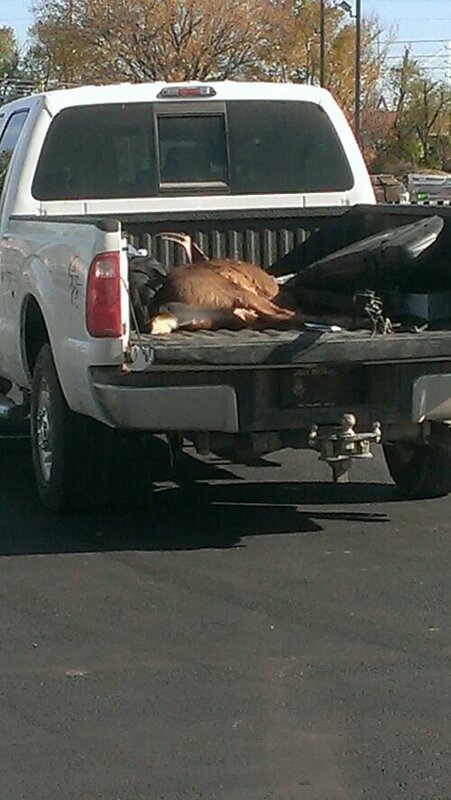 That is not two dogs snuggling in the back of a truck. That is a dog guarding a deer that has a very large set of antlers. I freaked out a bit. Bubba and Dude want to go in for a better look. Nope. You definitely don’t see things like that back home. After 4 years of small town country living I should be immune to things like this. This is normal here. I am not normal. I guess am not adjusting, acclimating and fitting in as well as I thought I was. I struggle with it a lot. I am beginning to recognize I might be going wrong somewhere. My kids already love the Kansas City Royals baseball team instead of my beloved St Louis Cardinals. Now they are calling carbonated beverages “pop” instead of soda. What is wrong with me and my parenting? How have I let things get to this point? If they decide the want to go to KU for college then I will know I have failed. Its a good thing we have a little time before then. this is a follow up to my post from this weekend. I teach high school and was walking back from lunch and overheard a snippet of a hilarious conversation between a couple of senior boys. I had hoped the aim issue would get better but apparently, even in high school and with a urinal, it is still a challenge to hit the target. i am a mom to boys. any mom to boys will understand my plight. my bathroom stinks. like pee. all of the time. When i was scrubbing the bathroom floor i was gagging. the amount of stagnant pee that had accumulated around the toilet was shocking. how does this happen in one week? i decided to have a talk with each of the boys individually. Bubba acted like he knew what i was talking about but definitely wasn’t going to take responsibility. In fact, he was a bit grossed out by the situation as well.